A punch bowl reception for speaker Roger Hanshaw, Speaker of the West Virginia House of Delegates, will begin at 6:00 p.m. Dinner will be served by SODEXO at 6:30 p.m. The public is cordially invited. Reservations may be made with the Chamber office before April 12, 2019. 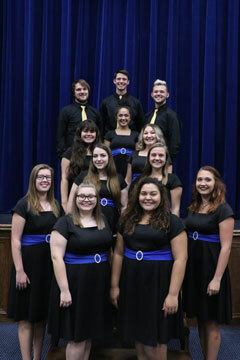 The West Virginians are one of the premier touring ensembles of the Department of Music at Alderson Broaddus, having served as ambassadors for the university and for the state of West Virginia since their inception. This talented and energetic group brings a high quality musical performance at churches, civic groups, and high schools across the region. The West Virginians were founded in 1977 and quickly designated official ambassadors for the state of West Virginia by the Governor. The ensemble has traveled throughout the country and in several foreign nations. The group regularly produces recordings and have televised several of their performances. Their popular West Virginia Set includes The West Virginia Hills, My Home Among the Hills, and the ever crowd-pleasing Take Me Home Country Roads. Eric and Jana Ruf, who will perform the National Anthem during the evening’s opening ceremonies, are both graduates of Alderson Broaddus and former members of The West Virginians.